The key to sustainable business success is personal growth. You are the lid on your business. It’s time to work on you, so you can give your team the leadership they deserve. Business success is great IF your life is strong. It’s time to make sure your corporate role works for you, not just everyone else. You need to plan your life as well as your business. Work-life balance is a myth. The 21st Century marketplace is all consuming. You will NOT live the life you want without a deliberate plan. Integration inspires ‘whole of life’ success. Are you wondering if it is possible to achieve business success AND have a great lifestyle? Do you feel like you are nearing the limits of your capacity? Everywhere you turn, does it feel like there are always more things to do? Is there often tension about priorities between business and home? What if I told you that the way forward is not just about working harder? It is about working on yourself. It’s time to take a fresh look at who you are, and make some decisions about what you really want in your life. Then create and implement a plan that enables you to make changes you need to make to achieve the progress you desire in business AND across the important areas of your life. 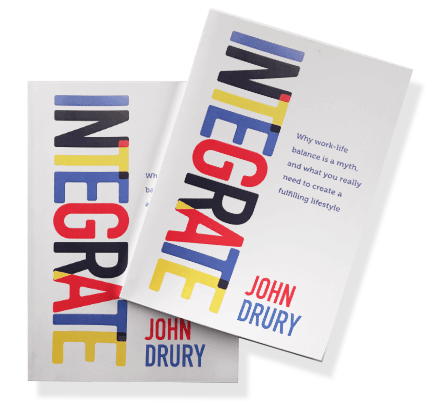 Who is John Drury to be able to help you? In 2007 I went through a very painful burnout experience after 24 years in a very demanding senior leadership role. I lost my way and made some dumb personal decisions that led to the loss of my career and my family. It was a long journey back to a place of wholeness and then to renewed sense of purpose. I had forgotten how to look after myself’. The lessons I learned about myself have enabled me to help hundreds of business owners and corporate executives. It has become my passion to assist high achievers to avoid the pain of burnout, and to fulfil their potential across their life. 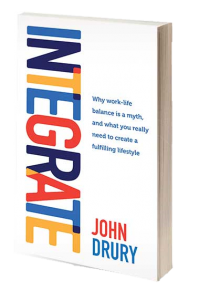 John’s book, ‘INTEGRATE’ challenges busy people to rethink their approach to life and work. The old concept of work-life balance is a myth. The passion to succeed and a 24/7 Smart phone dominated life makes the concept of balance unhelpful and unworkable. A 21st Century approach is needed! INTEGRATING work with all that is precious in your life is the only way forward. This book enables high achievers to see how they can pursue their goals and build a great lifestyle while they do it. his book Integrate and ‘work-life balance. changes in their life to build the life they want. From an organizational and value for money perspective the investment we made in John’s services will I am sure serve us for years to come, and we look forward to working with him in the future. I have benefited greatly from my coaching sessions with John Drury both professionally and personally. solutions for overcoming what at times previously felt like impossible demands on my time and energy. will reinvigorate your approach to many things in your life, whether that be at work or at home. John has been working with myself and my team for the last two years. He has helped me specifically in team structure and getting to the key issues very quickly... which have led to making strategic and wise decisions. I've no hesitation in recommending John for coaching and mentoring in team, management and leadership training and solutions. “The process John took us through was different to other Business Mentoring processes we have experienced. I felt it was very practical and we walked away with skills to be able to perform better at work. John was very hands on in the process and really helped us work through challenges until we found a resolution.